Another shot of 'Shoremond', the Ormond G. Smith estate designed by Hoppin & Koen c. 1910 on Centre Island. Click HERE for more on 'Shoremond' and HERE for interiors. Picture courtesy of SPLIA. My eyes are constantly moving over the structure; I'm not sure what to look at, what needs to be looked at, hmph. I just don't know. Someone, help me and tell me what I'm thinking, because I certainly don't know. jeff - look at this place and think "governors mansion" - a little more grandiose than the gov has here in maine but i can see it for ny or some southern state. look at that front hall - absolutely stunning. they must have drained an entire marble quarry in one shot. but like so many of these one-off eg beacon towers, they tore this one down when it wasn't even 40 years old. a real shame. all the amazing carving and stonework and especially the gardens lost not to mention the places taken as a whole concept the way they were created. even if they keep the house, when they split it off its estate, it loses so much and no one bothers with landscaping anymore. Yes, This was one of the best country houses built. Perfect proportions, beautiful elegant interiors. Fortunately it lives on in this wonderful blog! I agree that the water façade is not as successful as the entrance façade. Until I bought Michael Kathrens’ ‘Newport Villas’, Shoremond was the only Hoppin & Koen house I had seen. Apparently their idea of 'grand' was "three stories with lots of columns out front." They used the same formula in their Newport houses. 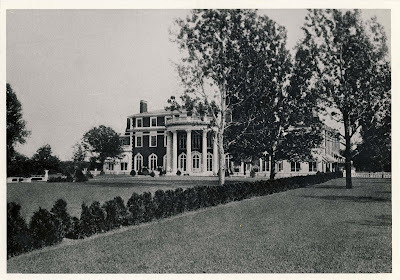 Considering the opulence of Shoremond, it is perhaps ironic that the original owner, Ormond G. Smith, was credited as a magazine publisher with being the ‘discoverer’ of the author O. Henry. I also love that Elsie de Wolfe did the interiors. The trellis loggia from Shoremond is pictured and described in her book ‘The House in Good Taste’, which is online at Project Gutenberg. I have the 2 photos from the de Wolfe book, I plan on posting them soon. Don't think it was ever 250 acres. Believe it was at most 60.
the beach and shallows beneath the cliffs. There were carved stone and marble elements turned green by the water.